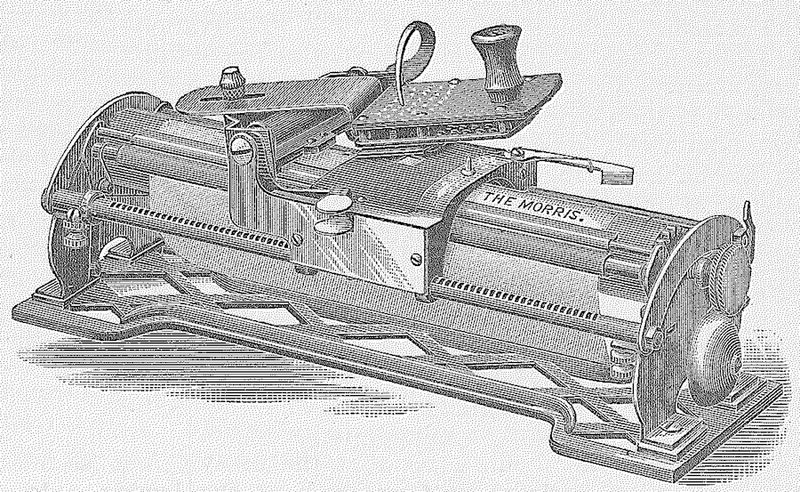 General view of the Morris typewriter from the Jan. 28, 1888, Scientific American. The Morris was a beautiful but unsuccessful index typewriter, designed by Robert Morris of Kansas City. The type was placed on a rubber sheet, placed under the index card. By moving the index pointer the correct character would be placed above the printing point. Read about the Morris in this Jan. 28, 1888 edition of Scientific American (for viewing or download): click here. Read about the Morris at oz.Typewriter here: On This Day in Typewriter History: The Morris, Wichita’s Elusive Jewel. Hi Mark. I posted on the Morris in January (http://oztypewriter.blogspot.com.au/2013/01/on-this-day-in-typewriter-history_14.html). I don’t know how the Kansas City claim came about, but Morris was from Witchita. Bob: I know what he said, but i’m from Wheaton, Illinois. I’ve noticed that these Scientific American articles fall short of modern journalistic standards, often failing to provide key information (information, at least, that historians would like to know). I note that this 1888 article fails to mention that the inventor had died already.